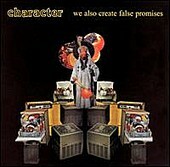 Character's We Also Create False Promises is an instrumental delight, the rare record that can hold your attention, even without the presence of words and vocals. Delivering indie-rock in a variety of forms, the band jumps around from late-night, airy jaunts through full on, though never overwhelming melodic rock. Experimental and fun, the group knows how to work sound and melody to their advantage, as is evident here. It's an appealing record that fairs well in the background for any occasion (it really turns up the ambiance), but also plays well as an attentive listen piece. I'll give it a B.